When Simone Moro freed this route in 1989 at the legendary Italian crag Cornalba, I had plenty of other things on my mind. For example playing in the garden or getting my diapers changed by mummy. At that time I wasn't even three years old. Last winter Simone suggested I try this route which I believed to be too hard for me. I really respect these routes at Cornalba, perhaps due to their importance from a historical perspective and due to their age. But things didn't feel too bad on the route, I managed to do all the moves apart from the crux where, in the beating autumn sun, I continued to slip off. I returned in February after the ice season and a rest period to enable my fingers to recuperate. 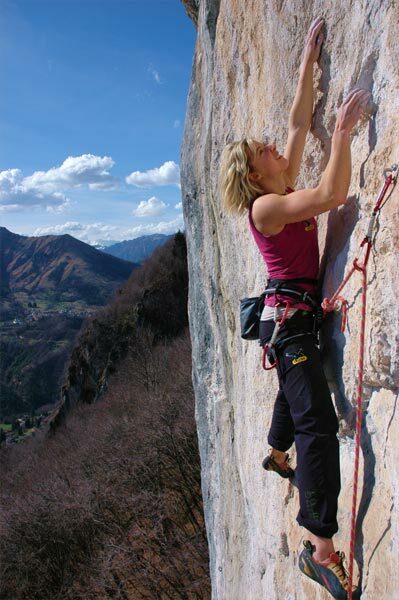 I wanted to try the route which, in this period away from the crags, had remained etched in my mind. I immediately felt food on the first section of the route and, much to my surprise, I managed to stick the monodoigt which represents the crux of the route. I returned highly motivated two weeks later and conditions were perfect: sun, a slightly overcast sky and therefore not too hot, a slight breeze but not too cold to freeze my fingers. Everything ran smoothly second go: the first half of the route, then the rest, then another couple of moves followed by another rest and then the section of crimps left, right, left undercling, crimp, monodoight, crimp right and then finally a good crimp and rest. Just the finishing meters and it was in the bag! I managed to send this route 7thg go which, considering my first experience at the crag, fills me with joy, especially since this route offers great climbing with a series of different moves which require both power and technique.